July is high summer here in Minnesota. 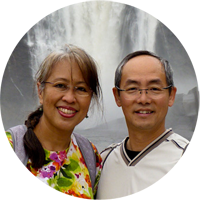 It is very hot and often humid (especially after a storm), not unlike the Malaysian weather. On such days, I prefer to make quick and easy dinners for the family so as not to heat up the kitchen. Steaming is ideal because I do not have to stand in front of the hot stove. I can just place the food in the steamer and allow it to cook with little intervention from me. 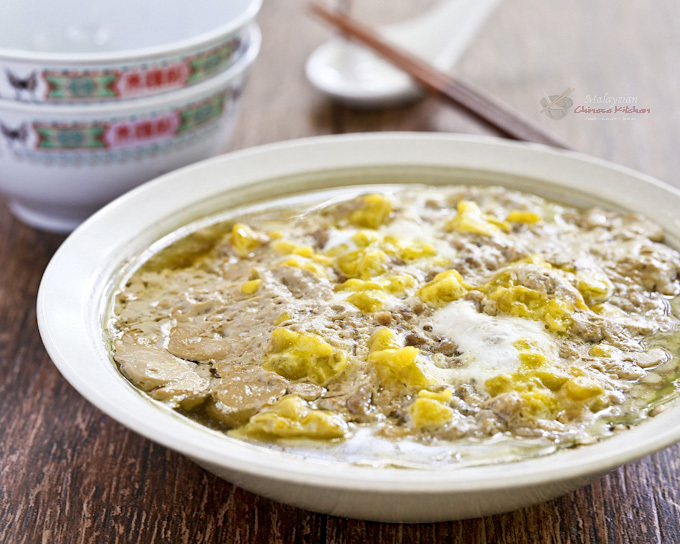 Fortunately, there are a variety of quick, easy, and tasty steamed dishes in the Chinese cuisine. 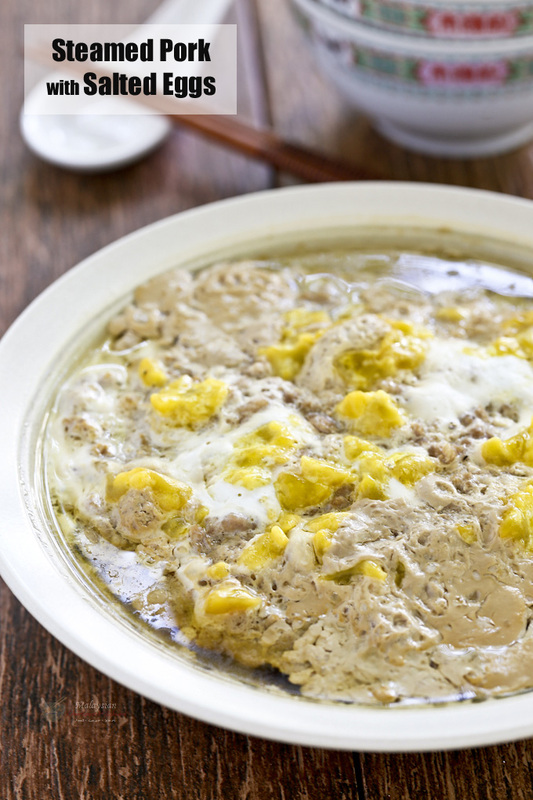 This home style Steamed Pork with Salted Eggs is one many of us grew up with. It uses only a handful of ingredients and can be prepared with minimum fuss. Cleanup is also a breeze because there is no oily mess. In fact, if you need only a small portion, it can be cooked together with your rice in the rice cooker. How easy and convenient is that? In this recipe, I used home cured Salted Eggs in brine. 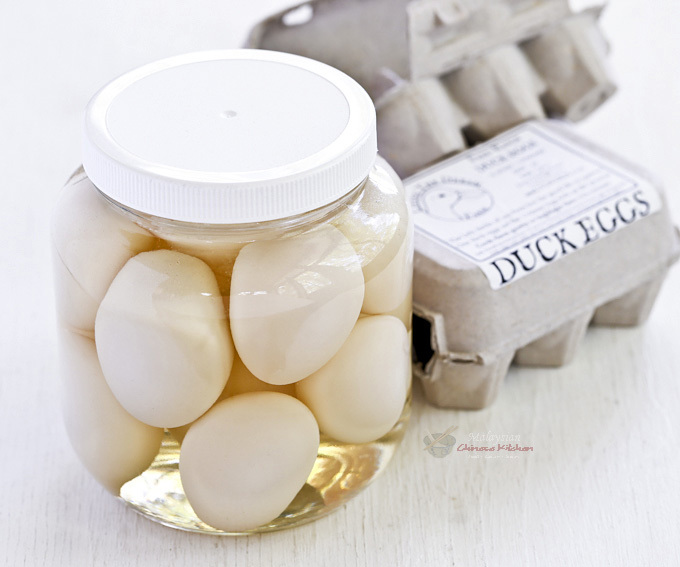 I salted a dozen duck eggs and only two remained. Saving them for a congee dish I have not eaten in a while. I am also thinking of salting another batch for mooncakes as the Mooncake Festival is coming up real soon. It takes five weeks for the eggs to be ready and so I should have enough time if I start now. Time to run to the store to get some duck eggs. Hopefully, they are still available. I can find them at one store and only in the summer. 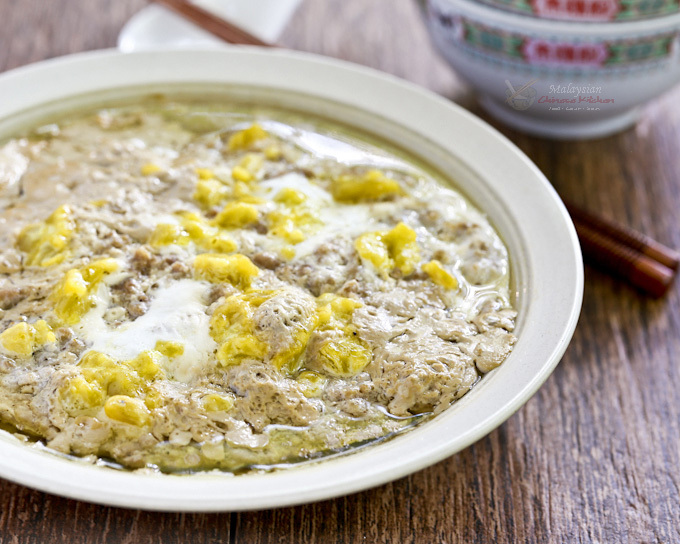 As for this Steamed Pork with Salted Eggs, you have to give it a try. It is big on taste even though it may not look the part. For many, it is comfort food – simple and oh so tasty! Pile on the rice please! Prepare a large pot with an inch of water and a steaming rack in the center. Separate the salted egg whites from the yolks. Cut the yolks into smaller pieces. Place ground pork in a shallow dish. Add soy sauce, pepper, and salted egg whites. Mix well with a spoon. Spread salted egg yolks on the top of the ground pork. Drizzle sesame oil on the top. Transfer prepared pork to the steamer. Cover and steam on medium heat for 30 minutes.